Meet Julia Rutland - keeping Indy looking and feeling fab for the most special days of life! What need did you see in the community that led you to start The Gifted Gown? In 2011 & 2012 we helped Pike High School collect donations and spread the word about their Prom Closet. As we were out in the community, we were inundated with people asking how they could get assistance as well. The Prom Closet was only open to Pike students (due to the security and safety of their students) so they weren't able to bring in people who did not attend Pike. We saw how many people in the community were not participating in events due to lack of financial resources and we thought if we could do something in a neutral location, collect donations and just give the gowns away, free of charge, maybe there would be even more people who could benefit. We serve the entire Indianapolis community and beyond and are open to anyone who needs a helping hand attending special occasion celebrations. We have had people come to us from other states and we are MORE than happy to serve! Everyone who comes to us are our guests and we love to treat them as guests in our home. All guests receive a gown or tuxedo/suit, shoes, an accessory item, and dry cleaning (courtesy of Deering Cleaners Downtown) free of charge. We work on an appointment basis and each appointment runs about an hour. Each guest is paired with a Personal Stylist to help them shop for the perfect outfit to suit their occasion and help them throughout their appointment with anything they need. How has The Gifted Gown changed over time? Becoming a 501(c)(3) nonprofit organization in 2016 opened an exponential amount of doors and afforded us the opportunity to help our community in better, different, and creative ways. We've also met the most amazing people and organizations along the way. Another huge change is that we began with 25 gowns, just wanting to help people and not knowing what that even looked like exactly, and we now house over 1700 gowns! We used to have to work on an event-by-event basis and find a community partner each year to host us, and all of our gowns and tuxes, for one large annual event. Now we have our own location and can help people on a year-round basis which has been truly life-changing for us and for our community. Having our own space has had the largest impact on our organization because the ways we are able to help are endless and has let us reach so many more people who need us. 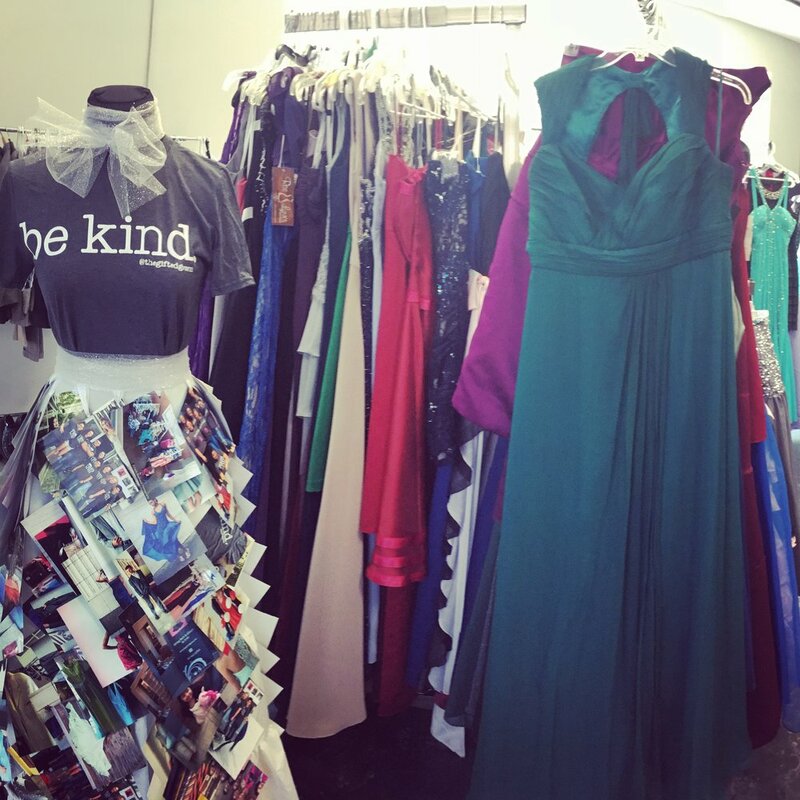 What types of items can be donated to The Gifted Gown? We accept donations of new and like-new condition formal gowns, tuxedos/suits, jewelry and formal accessories, evening bags, women's and men's formal shoes, bow ties and ties, new (unopened) make-up, eyelashes and nail polish, and donation of services (e.g. hair styling, make-up, haircuts, etc.) Financial contributions are also accepted at anytime online or via regular mail. All donations are tax-deductible and we are happy to provide you with a receipt upon request. Spreading the word about us and letting people know we exist is the very best way to help. Donating items helps us to keep on doing what we do and we appreciate each and every piece! There are 6 Donation Locations for your convenience: Boomerang Boutique, Queen Bee Vintage, The Hatch, Elegant Hair Designs, Love's Hangover, and The Brow Bar. We also have a website, GiveGab, where we post our current volunteer opportunities and we keep this up to date so people can log-on and sign-up to volunteer for the opportunity that fits them and their schedule best. Another easy way to help is to choose us as your community partner when you shop at Kroger and use your Kroger card (The Gifted Gown 44099) or shop at Smile.Amazon.com (smile.amazon.com/ch/47-5487686) - you give back without even thinking about it and it helps us so very much! Is there a specific example you can share of how a dress (or tux) has changed someone’s life? There are so many people who touch our hearts and one that stands out is from our 2016 event. We had 4 young people (2 couples) who wanted to attend prom but just didn't have the means to do so. They said they didn't want to burden their parents with another expense as they had enough on their plates just taking care of them. So, they hopped on the bus and came to the location where we were able to take appointments that year. They came in and said how surprised they were at the selection we had and how many sizes we were able to carry. The young men were able to find 2 great suits and each young lady looked so beautiful in their gowns. We all were crying by the end of this because it was a happy moment and one we were able to share with them. A couple of days later I received an email from one of the young ladies thanking us for what we do and she said that without us she wouldn't have been able to go to prom. THAT, is the entire reason we are here and THAT makes all of this completely worth it. That experience is also why, wherever we end up, we will always be on or very close to a bus line so no one has to miss out on getting to us and getting what they need. Any idea how many formal outfits have been donated over time? How about the number of people in our community have had the chance to benefit from The Gifted Gown? Any idea how many? We're honored to have helped over 550 individual guests since 2013 and continue to grow this number each day. Where do you see The Gifted Gown in the next 3 years? I see us growing and tripling the number of people we help, adding new services and programs, partnering with amazing local and national organizations and companies and re-designing our space to house even more gowns and tuxedos/suits, shoes, and accessories. How can we follow along on the great work that The Gifted Gown is doing in the community? We'd LOVE that - thank you!! Volunteer to help kids #dopromdifferent this year. All sort of opportunities are available beginning this weekend over on GiveGab.